MSN Recorder Max enables you to record your favorite MSN chatmate's webcam video or capture the whole MSN conversation easily and instantly. It supports all versions of MSN. You just need to click "record" button to easily record MSN video and the saved video files are high-quality with a really small size. You can also choose Full Screen, Selected Window or Selected Region to record and upload the video you recorded to YouTube directly as well. ...... MSN video. You can set the video format to record and the saved video files are high-quality with a really small size. * Record your favorite MSN chatmate's webcam video easily. * Capture the whole MSN conversation in real time. * Record full screen or whatever items shown on your desktop freely. * Upload the video you recorded to Youtube directly. 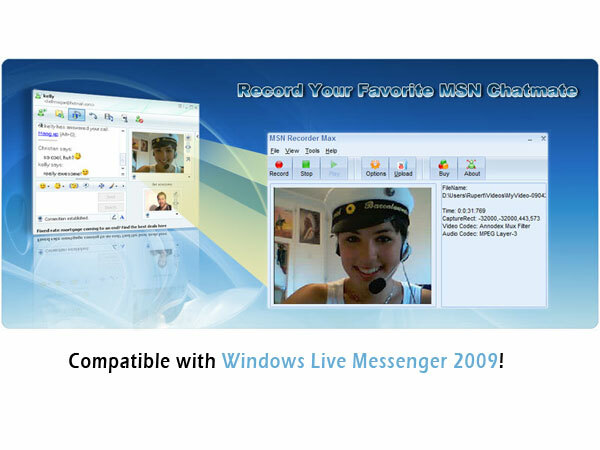 * Compatible with All versions of MSN messenger and Windows Live Messenger including the latest version! Qweas is providing links to MSN Recorder Max 4.4.2.8 as a courtesy, and makes no representations regarding MSN Recorder Max or any other applications or any information related thereto. Any questions, complaints or claims regarding this application MSN Recorder Max 4.4.2.8 must be directed to the appropriate software vendor. You may click the publisher link of MSN Recorder Max on the top of this page to get more details about the vendor.